CARLSBAD, Calif., June 2, 2017 /PRNewswire/ -- Viasat Inc. (NASDAQ: VSAT), a global broadband services and technology company, is pleased to announce the successful launch of its Viasat-2 satellite aboard an Arianespace Ariane 5 ECA launch vehicle. The Ariane 5 ECA carrying Viasat-2 lifted off yesterday, June 1 at 4:45 pm PDT from the Guiana Space Center, located in Kourou, French Guiana. Approximately 29 minutes after liftoff, the Viasat-2 mission was underway with the satellite separating from the launch vehicle. First signals from the satellite were acquired shortly thereafter through a ground station at Hassan, India. In the coming days, Viasat-2 will start orbit raising with its chemical propulsion system, followed by solar array deployments, and will then switch over to its electric propulsion system to complete orbit raising over the coming months. Viasat expects it will take several months for Viasat-2 to reach its final orbital destination, located at 69.9° west longitude. Mark Dankberg, Viasat's chairman and CEO commented, "Today's successful launch is a momentous event in Viasat's history. It represents the culmination of hard work, dedication and commitment to technical excellence from across the Viasat team. We also want to recognize our launch team partners, Boeing and Arianespace, for their support and collaboration in helping us successfully launch Viasat-2." Viasat-2 is a geostationary satellite that operates in Ka-band frequencies. It was designed to offer high-capacity connectivity and wide coverage, with the flexibility to move capacity to where demand requires it. Viasat-2 is expected to significantly improve speeds, reduce costs and expand the footprint of broadband services across North America, Central America, the Caribbean, a portion of northern South America, as well as the primary aeronautical and maritime routes across the Atlantic Ocean between North America and Europe. Dankberg continued, "The innovations in our Viasat-2 spacecraft and underlying network will enable us to be one step closer to connecting the world, and delivering new higher speed fixed and mobility services that will continue to compete with traditional broadband services." "Arianespace is excited to have delivered for Viasat! 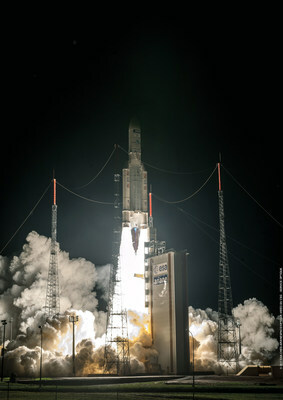 We are proud to have launched one of the world's most advanced telecommunications satellites, Viasat-2, safely to orbit. Great things are in store for our friends at Viasat," said Stéphane Israël, CEO of Arianespace. Mark Spiwak, president, Boeing Satellite Systems International. social media: Facebook, Twitter, LinkedIn and YouTube. in-orbit testing and operation of the Viasat-2 satellite, including the effect of any anomaly, operational failure or degradation in satellite performance, and the Company's ability to realize the anticipated benefits of the Viasat-2 satellite. In addition, please refer to the risk factors contained in Viasat's SEC filings available at www.sec.gov, including Viasat's most recent Annual Report on Form 10-K and Quarterly Reports on Form 10-Q. Readers are cautioned not to place undue reliance on any forward-looking statements, which speak only as of the date on which they are made. Viasat undertakes no obligation to update or revise any forward-looking statements for any reason.